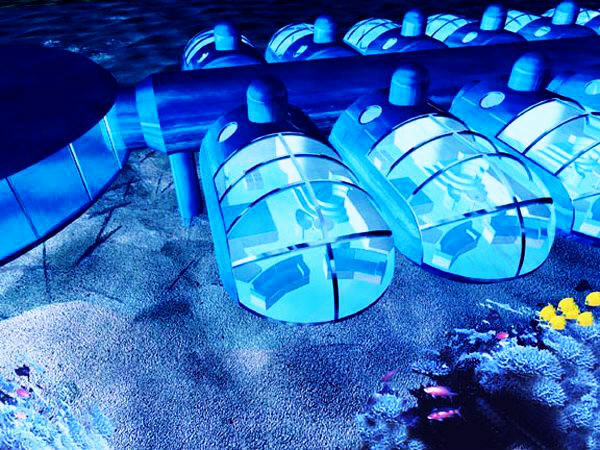 Just think about spending a vacation in an underwater hotel and the first thing that strikes you is a question mixed with awe- What! Nevertheless, you can make this 'what' a 'wow' if you dive into the blue seas of several particular coast, you will find some dreamy underwater hotels. After you finish with your stipulated travel itinerary in Sweden, spend a day in the Utter Inn. Built in the shape of a Swedish red house with white gables, this underwater resort is a one room hide out beneath 3 meter from the water level in the Lake Malaren. The engaging feature of this inn is, once the guest checks in, they are completely on their own which helps in the process of enjoying a different time in one's own ways. The feeling here is like living in a aquarium! It is a five star hotel plunged deep in 40 feet under the sea with aesthetic architecture and decor. Guests can stay in the dream like rooms made by transparent acrylic walls offering a min blowing view of the surrounding marine life. Other facilities that the hotel provides are also out of the world with a luxury submarine tour and an outing in the Poseidon Mystery Island. Currently under construction, Hydropolis promises to be one of the most majestic and magical creation by human being in modern era. And this is bluntly evident from the figures associated with it. A budget of $550 million and construction covering 27 acres in the depth of 66 feet on the Persian Gulf, Hydropolis comes with a bang! The 220 suite hotel will be built in a ubble-shaped structure and consists of three major aspects- The Land Stations (the guests will witness a warm welcome here); the Connecting Tunnel (1700 feet transparent train tunnel that transports the guests to the hotel) and the Children's Sea World. The numbers are enough to take the carpet beneath your feet making you fall on th hips! Underwater dining experience is at its best in the Ithaa, the restaurant in the resort under title. Seated at five meters below the sea level, Ithaa is a all glass underwater food joint with a deliciously versatile menu and cozy service. The entrance to this restaurant is through a over water platform and once in you can feel almost a personalized charm in this 12 seater structure. The design of the hall is so planned to give the diners a 180 degree view of the sea life with a glass ceiling. Be a member of the not much crowded club of the underwater dwellers and this is one membership you won't regret! The first name that deserves a prime slot in this list is the Jules Undersea Lodge that derives its name from the celebrated marine adventure story teller Jules Verne (who doesn't know about Around The World In Eighty Days, Eight Hundred Leagues On The Amazon and 20,000 Leagues Under The Sea). If you are a diving enthusiast, it will be a lot easier for you to enter this hotel lying 21 feet under sea level as compared to others. However, there is a 3 hour crash course on diving is on stand by to assist the non divers. In operation as a hotel since 1986, Jules Undersea Lodge offers all the services that you get to avail in any other hotels on the earth surface including air conditioned rooms, DVD system, hot showers and a unique gourmet experience provided by the world's only 'mer-chef'.